One of the delights of cycling in the Dales is that there is such a wide choice of routes in this beautiful part of Yorkshire. I recently completed an unscheduled ride through Coverdale during a day trip from Richmond to Skipton. In cycle touring terms Coverdale is a very short stretch (15 miles) but would make a good introduction for mountain bikers looking for a road trip of challenging hills and stunning scenery. I would recommend doing the route in the opposite direction from the one I took. Starting from Kettlewell (or better still from Grassington to get properly warmed up) means that the considerably stiffer part of the climb is tackled early on; if you set out from Middleham – like I did – you face a gradual climb for 12 miles before clinging on to your brakes for about three miles of at times terrifying descent. The picture above shows one of the 1 in 4 descents shortly after the highest point of the ride. The sun filtered through the low clouds and mist when I took the photograph and obscured the furthest hill. Why not see it for yourself? Posted by Chris on November 16th, 2009. Chris, good post, and great photo. Most of my cycling is from home, in the West Pennine Moors area of Lancashire. I've been meaning to explore Yorkshire on a bicycle for a while, and recently bought a book called 'Cycling in the Yorkshire Dales'. I must get it out. It would mean putting the bikes on the back of the car, though. You're lucky if you have this on your doorstep. I'm not complaining of course. The West Pennine Moors are beautiful too, but sometimes I'd like some new scenery. 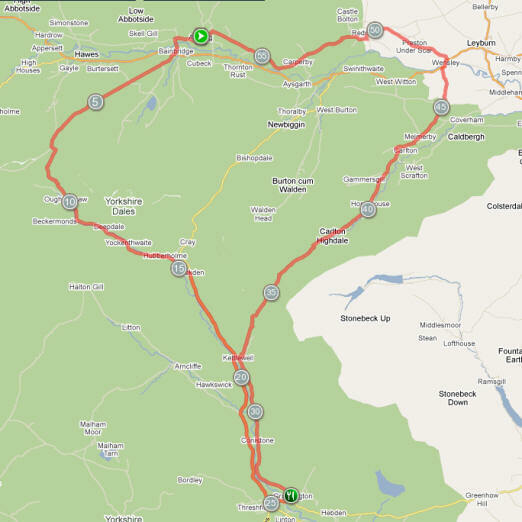 Two weeks on Monday and I should be cycling through Coverdale from the Kettlewell end. Mountain bikes on the back of a friend's car and a few nights in Askrigg. Can't wait. Your plan sounds good. If it is Easter in two weeks, I'll be MTB-ing in Snowdonia. Patrick wrote: Is that Easter? Saturday 27th March: I drive up with my B&B roommate, our mountain bikes and my T2. Three of us do the Tan Hill loop; the other two go for a walk. Mucky beers in the King’s Arms (The “Drovers Inn” from All Creatures Great and Small). Sunday 28th March: all five of us go for a walk. Then three drive home. Monday 29th March: my car share roommate and I cycle the Coverdale route on our mountain bikes (possibly missing out a sticky-out bit to Grassington). Then he goes home with both mountain bikes, my walking gear and anything else I can manage without. Tuesday 30th March: I cycle home on the T2 following as much of the planned Morecambe to Mappleton C2C route that I can take in as far as Driffield (I miss out the coast that day). And that only took about 100 emails to arrange between the five (originally seven) of us. Hopefully there's no canoeing involved. Do you all know each other? I suppose at a certain age these trips have to be worked around other family commitments – not easy. I hope the weather stays as nice at it has recently. The Shimano Hyperglide ramps on the sprockets are no longer in synch now that the HG50 Deore and Tiagra cassettes have been broken up and reassembled as this 13-34 custom cassette (from 11-34 and 13-25). The lack of synchronicity may only affect the downshifts anyway, so I'm not too worried. I'll have a spin on Saturday and a longer ride on Sunday if all is well. Enjoy Snowdonia, Patrick. Why didn't you just fit an 11-34 cassette? Easter seems a long way off but it's only two weeks. My MTB is a bit of a mess actually. The drive train is all rusted up after a winter in the garage. It must have been wet when I put it in. It's an old bike and the frame is pretty rusty too. Incidentally, what is the bike in your photo at the top? I didn't fit a 11-34 for a number of reasons: with my 50T large chainring I will never push a gear so far above 100" (the gaps are too big between the upper gears anyway); I like to use the large chainring whenever I can (someone told me that your chain is better looked after when the load is spread over more teeth – I'm not sure about that, though), but I previously only used the large chainring in combination with the 21T rear sprocket – the other gears are just too big for normal riding. So basically with a 11-34 cassette the largest gear is redundant (for me at least) and when I was on the large chainwheel with my old 11-25 cassette I couldn't get to the gears I wanted because there was too much chain deflection. I now have 13/15/17/19/21/23/26/30/34 with smaller jumps – in terms of "inches" between the higher gears. There is less chain deflection and I still have the option of the 23T sprocket – 26 at a pinch – when running from the large chainwheel. I did worry about the other cyclists in our group next week and the state of their bikes. I know one has cleaned his bike. Fingers crossed about the other. The bike at the top of the post is a Coventry Eagle Touristique from the mid 80s. It's rusty, but I'm hoping to tidy it up during the summer. I see. The chainline on my tourer means I use the big chainwheel only on the two smallest sprockets. 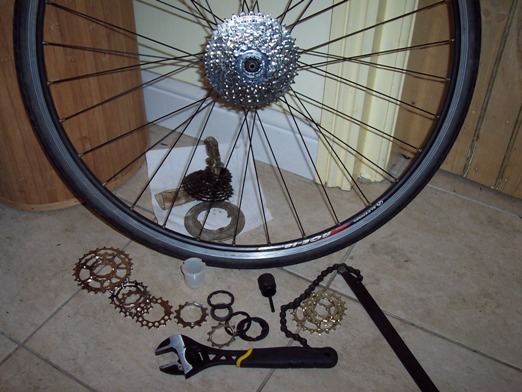 I don't follow that chain wear argument – if you're using a bigger chainwheel to spread the load then you're using a correspondingly smaller sprocket so it balances out (assuming the load spread thing is correct, and I'm not sure about that either). Just revisited this post. It happens to be four years ago to the day since I last rode the route shown in my little map above (although it wrongly missed out Hawes, and Fleet Moss – arguably the toughest climb in the Dales). Actually, that's not right, is it? To get the same or similar gear you run big/big or small/small. I'm still trying to keep on the 50T chainring and go halfway up the block to the 21T sprocket for most of my riding – all things being equal. Chris wrote: Actually, that's not right, is it? To get the same or similar gear you run big/big or small/small.